Each frame is .1 second apart. The swimmer breathes at the end of each right arm pull. Frame #1: This picture illustrates a feature of most top crawl-stroke swimmers. The right arm entry is made at full stretch (no underwater gliding) and is accommodated by a very linear posture in the total swimmer. The upper alignment of Janet Evans' arm, body, and leg is almost a straight line. Of particular importance is the head position. This is known as the "swimming blind" position as the profile of the face is parallel to the water surface, that is, the water line is well above the hair line and the eyes look directly at the pool bottom. This position is achieved by many crawl stroke swimmers, particularly females, and is characteristic of Jenny Turrell (1970s) and today's Brooke Bennett. Frame #2: Evans' pull starts immediately with flexion at the wrist and the shoulder fully elevated. The inertia of her recovery and its transition into re-positioning for propulsive pull is counter-balanced by a left leg kick. Frame #3: The right hand feathers to the outside as the arm flexes more and medial rotation of the upper arm commences. The reason for this short-lived feather is not obvious but could be a brief movement to counter-balance a part of the left arm recovery. The kick in this position is not propulsive but rather, creates a drag force to counter-balance the still predominantly vertical forces developed by the re-positioning movement of the right arm. The counter-balancing keeps the hips high and streamlined. Frame #4: Janet Evans commences to lift her head which was a trademark of her swimming style. It is hard to justify this initial and subsequent head movements as being beneficial. To counter-balance the vertical forces created by the head lift the forearm/hand combination, which constitutes the propelling surface, creates vertical as well as horizontal force components. It is at this stage that an "elbow-up" position is sacrificed to accommodate vertical forces. Frame #5: The swimmer's head is emerging above the bow wave. The left leg is raised to prepare to kick. The propelling surface of the right arm is primarily aligned in a horizontal plane although the body is not sufficiently angled on its side to produce a long adduction movement at the shoulder. Frame #6. 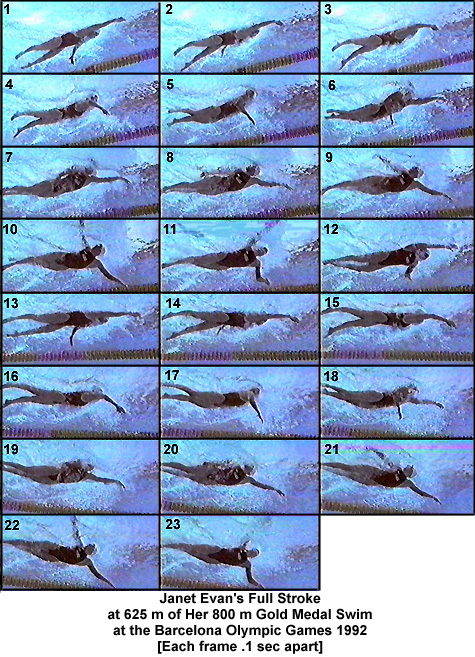 The left arm has very rapidly entered the water, the wrist flexed, and vertical forces immediately created. This occurs in concert with the turning of the head to the right to breathe. Hip roll to the right side is initiated as is a right leg kick. Frame #7: Both arms are creating small forces at this time. The left arm, particularly on the hand surface creates a small propulsive component as part of the resultant force of the arm. The right arm is at the end of its propulsive phase and is initiating an exit. The head is being returned to the water which is counter-balanced by the continued right-leg kicking action. Hip roll to the right continues. Frame #8: Janet Evans has continued to keep her face profile to the right. Normally, one would have anticipated that by this time the face would be returned to a position which would promote "swimming blind." The hips have continued to turn to the right as the right leg continues to counter balance the left arm press. Frame #9. The left arm continues to press down counter-balancing the right arm recovery which has a large vertical component because of its almost straight position. The arm positions are virtually opposite each other. The face profile is still to the right. Frame #10: The face/head movement is "locked" in phase with the right arm recovery. This slow movement contravenes popular notions of breathing actions being independent of arm positions and occurring outside of the effort phase. The right-leg kick is completed. The forces created by the kick and the vertical component of the left-arm pull support the long, high, almost straight right-arm recovery. The shoulders appear to be turned to the right to a much greater degree than the hips, possibly because of the need for the right leg to create vertical forces (which would not occur if the hips were rolled to the same extent as the shoulders). Frame #11: The face is turned to look forward and down with a very rapid movement. The left arm applies forces directly backward while the hips, and shoulders rotate and the right arm sweeps forward with considerable speed. Frame #12: The fingers of the right hand are just entering the water. The left leg starts to kick to counter-balance this movement. The head starts to look down. Frame #13: The position in frame #1 is attained. The head seems to be oriented slightly more forward as opposed to directly facing the bottom of the pool. The shoulder is elevated to produce the longest reach forward possible. The remaining frames give a slightly different view of the actions already described. Frames #14-#23: The consistency of Janet Evans' stroke cycle is striking. Janet Evans' stroke is not symmetrical. It contains significant vertical movements which require allocating potential propulsive forces to counter-balance those extended and unproductive aspects of the stroke. In theory, there is much that could be improved in the technical aspects of this swimmer, and yet, this is the style of an Olympic Champion, albeit one who is performing considerably slower than when at her peak four years earlier. It is not known whether the "faults" commented on here were responsible for Janet Evans' slowing since the previous Olympic Games. A notable aspect of this stroke is one that is similar between many high-rating female distance swimmers. The length of time taken in recovery is very short. The entry is ballistic using the inertia of the recovery to "blast" through the re-positioning phase of the underwater stroke, to get to a powerful propulsive phase in a very short time. The speed of her recoveries is such that when one arm appears to finish its propulsive movements, the other arm commences its propulsion. This produces a desirable feature of the swimmer being subjected to an almost continuous propulsive force. There are no long delays between force applications, and none to the same extent as those exhibited by great male swimmers (see Murray Rose, Keiren Perkins, and Evgenyi Sadovyi on this web site). It is possible that the physiological differences between males and females, particularly in the way that oxygen and glycogen are used for endurance metabolism, supports female swimmers performing this high rating, short power-application-phase form of swimming, something which could possibly not be tolerated by males.